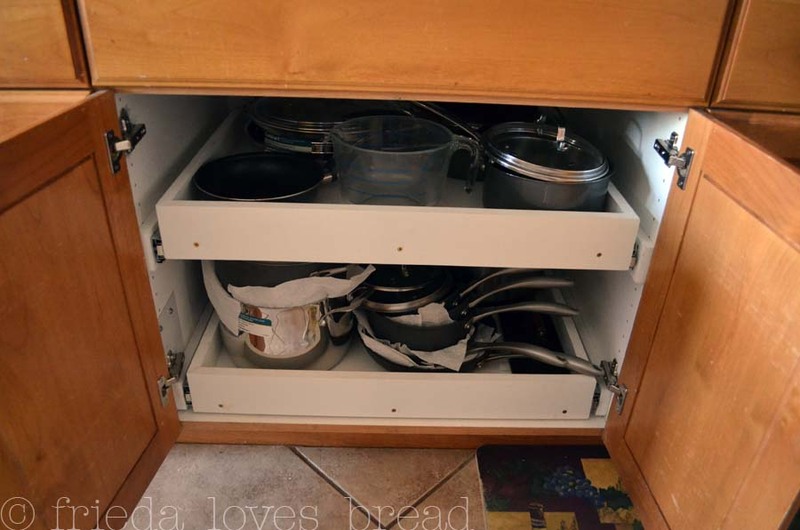 Frieda Loves Bread: Pull Out Cabinet Shelves! 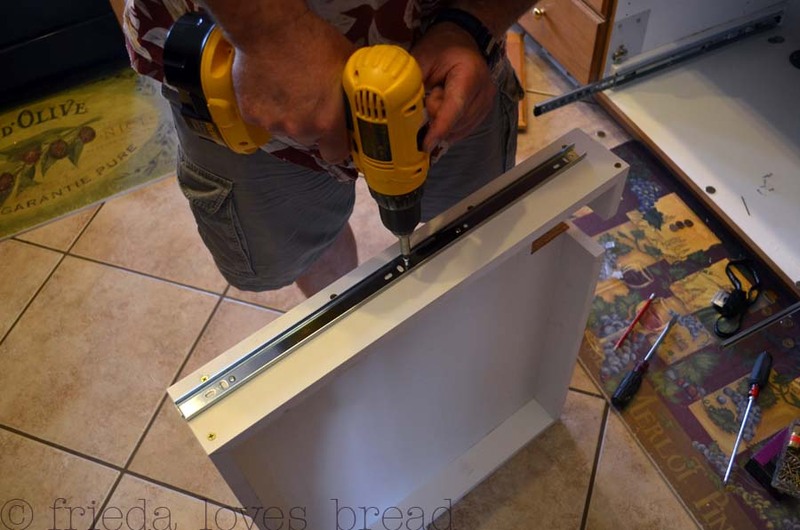 10 Pull Out Cabinet Shelves! Kneel down. Take pans out. Grab the needed pan. Put other pans back. Curse. Repeat. I got tired of kneeling down on the hard tile floor to get the pan I needed waaaaaay back in the dark recesses of the cabinet ... dubbed ... "the black hole." My neighbor showed me what her hubby built ... pull out shelves for her cabinet. Once she showed them to me, I drooled. I convinced sweet-talked my hubby into making them ~ and he did! 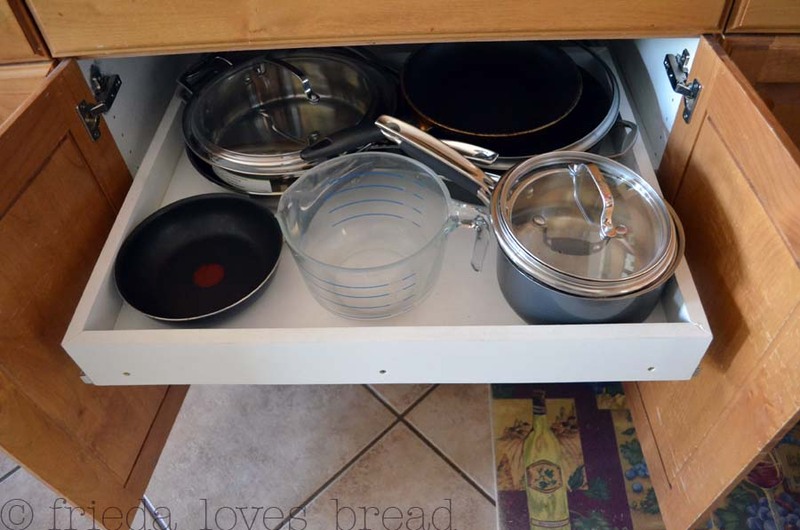 He purchased two sets of full extension drawer glides at Home Depot that would support 100 pounds each, strong enough to accommodate my heavy cast iron dutch oven. One drawer glide is attached to a "spacer," then attached to the inside cabinet wall. The spacer allows for the drawers to be pulled without hitting the cabinet doors. He used two stacks of quarters to raise the glide to the desired height. After building the roll-out shelf, he attached the other set of glides. Notice the notch at the back of the shelf ... That is where my gas line is, leading up to the cook top above. 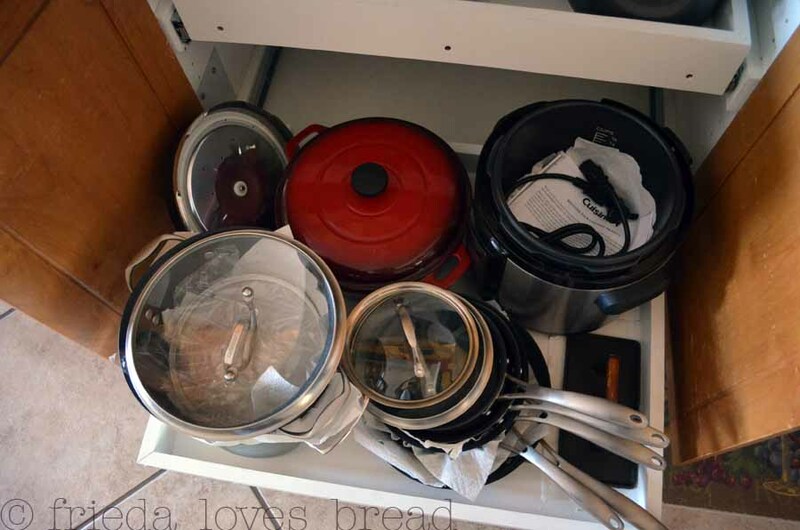 He made sure the bottom shelf was completed first and asked me for my tallest appliance ... the electric pressure cooker ... then measured for the placement of the top roll out shelf. 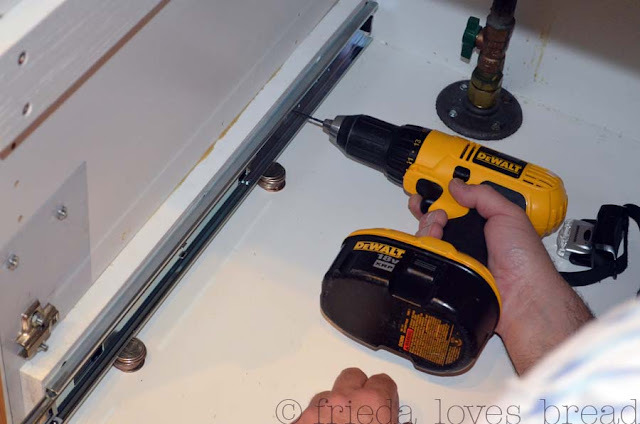 The full extension glides allow me to pull out the shelf all the way ... no more black holes! Ahhh I've been asking my hubby for these. My sister-in-law has them. He says when winter comes. He's a contractor and it's his busy time plus he's buildling me a garage. I don't ask for much do I?? Sometime. I'll just drool for now! Julie, he's building you a garage?!? So nice!! My hubby waited for summer to be able to pull out his table saw from the garage and make these; I can see where this is a winter project during a busy summer. I'm keeping my fingers crossed for you! I love my pull outs. Isn't it great that your husband is so handy? I'm so jealous of your outdoor oven!!! Wonderful...I do believe I'm going to forward this to my hubby! Wonder if we could do one of these just on our bottom shelf. I don't mind the top one, but the bottom one is just too hard to get to. Now I've gotta find me a handyman (usually a brother gets suckered into it). Tonya, you're right, it's the bottom one that is hard to get things out of ~ but I like the top one, too! Brothers can be great handy men! My husband takes out a screwdriver and I say a Hail Mary. He tries. But... well they all can't be handymen. I'm lucky enough to have this in my kitchen too, it is wonderful. Glad you have a handy husband he did a great job!